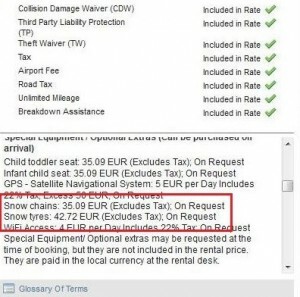 Advise and booking details for winter tyres (tires) and snow chains for your cheap car hire in Europe or the USA. Winter Tyres: Drivers travelling to winter/icy destinations should always reserve winter tyres (or tires) in advance. 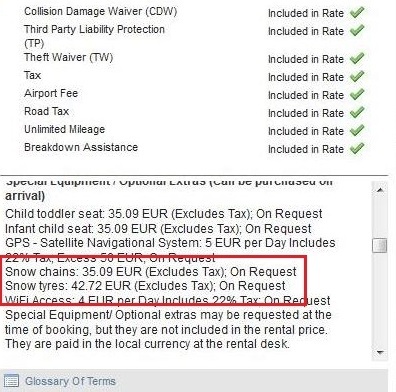 In countries such as Germany, there is a mandatory charge for winter tyres in cold weather, so it is worth checking if the total cost including the fee is worth it..
You will note the price is usually between €35 and €50 per booking – and is on request – our booking system doesn’t allow you to make this request when booking in some instances, but please still proceed to book, and email us (mail@pricecarhire.com) after you book, and we will make the snow tyres request to the car hire provider for you. In 95% of bookings, the snow tyres will be provided in the vehicle you booked, if the provider cannot provide your request, your booking can be cancelled at no cost. Please note Special Equipment/ Optional extras may be requested at the time of booking, but they are not included in the rental price. These can be requested to any booking at the payment – please note Special Equipment/ Optional extras may be requested at the time of booking, but they are not included in the rental price. Many rental cars in European Alpine/Mountainous regions now come with all weather tyres. They are good for driving on 99% of the roads in the Alps in the winter. Snow chains aren’t included in all rentals, but would only be needed in extreme circumstances and private driveways etc – so you should add these when booking, or collecting your winter ready car rental.